So we were gone to the beach house, then went to fair, and while we were gone, we had a home invasion. Poor "Little", our dog, had her leg cut all around the top and the skin was slipping down. Yucky, huh? She immediately got a leg lift at the vet and we kept her indoors for a long while. Kiely and I were afraid to let her out at night...What did that? What's out there that chews dogs up? It was winter, no fleas. 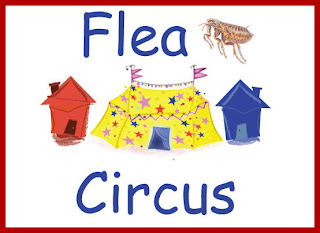 In the mean time, fleas were having a grand "flea circus" in our house. Three bombing sessions and still, in a day or so all are back tormenting us. Corbin, my grandson is at this moment telling us about a scary movie where fleas are coming out of this guys eyes. I'm going to have bad dreams Ewwwwwu! Word just in....the assassin's are coming! Gotta' go get outta' here for a few hours...So party-on fleas your time is coming and you don't even know it--so in about an hour, I hope your flea circus begins and you all DIE! I'd love to know what that horror film is, thanks.